Yesterday was our first Tatoeba day, so today I'm publishing stats about what has been been achieved that day, as well as more general stats. 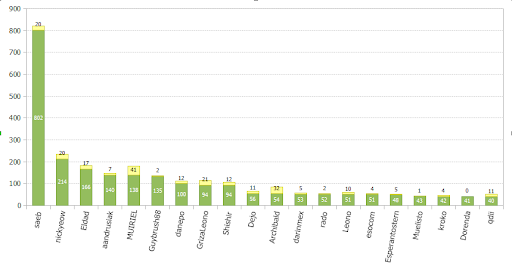 The chart below shows the number of sentences added on Nov 13th for each language. Sadly, the record set on August 18th of 3465 sentences added was not broken. We only made it to 2899. It's still not bad though, since it's the 2nd most important day, in terms of sentences added (and by "sentences added" I mean "new sentences + translations"). 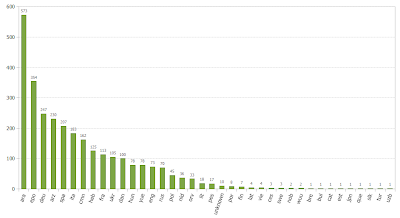 The chart below shows the number of sentences added (in green) and the number of sentences modified (in yellow) on Nov 13th, for the top 20 users. You'll excuse my laziness but I only used the number of sentences added for the rank. Saeb wins the day, by far, with 802 sentences added! Congrats :D Second place goes to nickyeow, and third place goes to Eldad. The top 5 hasn't changed. English - 158,000+. It looks like English has been growing a little bit. Japanese - 153,000+. Japanese is standing still. You can tell we don't have a very strong Japanese community. French - 53,000+. French seems keeps moving at a steady pace. German - 32,000+. German is progressing better than French, but still not quite as well as Esperanto. Arabic - 6,500+. Great boost for Arabic! Hebrew - 4,500+. Great boost for Hebrew as well! Hungarian - 3,000+. Hungarian joined the 1,000+ sentences club! Very good progress. Danish - 2,000+. Danish is new to the club with very good progress as well! 55,735 sentences added in October. About 25,000 sentences added since the beginning of November. We've reached 600,000 sentences in total today! We will soon have 76 languages. 5 are waiting to be added: Galician, Irish, Interlingua, Lojban, Toki Pona. Note that the last 3 languages are constructed languages. A potential date for the Tatoeba day would be December 11th. Although it could be December 18th as well. We'll see what suits best for everyone.